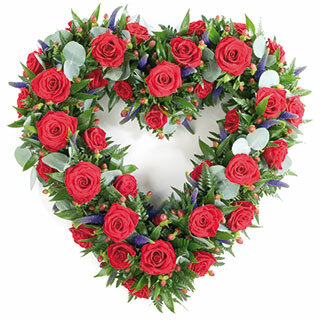 Blossom Florists Chelmsford are funeral flowers and wreath tributes specialists. 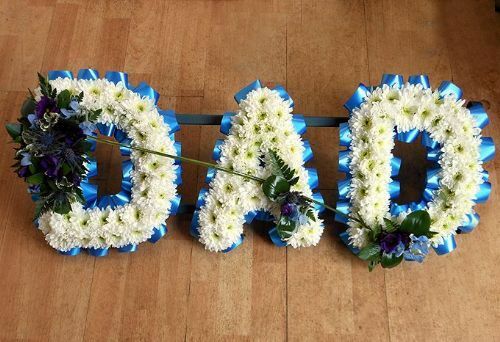 With many years experience, our talented funeral florists are able to create beautiful wreath tributes and our professional drivers will arrange delivery to the undertakers, Funeral Directors, Crematorium, Church or home. Once you have ordered your funeral flowers, our florists will review your order and if necessary will call the Funeral Director to check flower delivery time. If your funeral wreath is going to the crematorium, we will deliver an hour or two before and place your funeral tribute by the name plate in the Chelmsford crematorium garden. Our talented florists can create all tributes from a small funeral bouquet to funeral letters or bespoke funeral tributes. The passing of someone you love is an extremely difficult time and sometimes it’s hard to express your emotions in the right way. Often flowers can be a nice way to express some of your feelings and to help pay your final respects to a loved one. Here at Blossom Florists we realise the importance of creating the right funeral flowers and will work with you to allow you to create what you feel is right for the day. From beautiful coffin sprays to traditional wreaths and sympathy bouquets, we have a wide variety of styles for you to choose from. We don’t believe in profiteering from grief. There are more important things in life than making money. This is why we at Funeral Flowers Chelmsford keep our prices as reasonable as possible without compromising on the quality of service we offer. Click here to view our floral tribute ranges. Funeral Sprays are a popular tribute expressing sympathy. Traditionally sprays come in both single ended and double ended designs. Double ended Funeral Sprays sometimes referred to as Casket Sprays are often used to adorn a Casket or coffin with great splendour. Funeral Sprays are available in a wide range of styles, colours and sizes designed to suit your specific requirements and can be delivered to a Chelmsford Undertaker, Chelmsford Crematorium or the house. Floral wreaths are probably the best known of funeral and sympathy tributes, their ornate circular design is extremely versatile and are perfect for sending direct to a funeral as a mark of respect. The ring signifies eternal love or friendship. Available in both contemporary and traditional designs, our wreaths come in a wide variety of styles, colours and sizes. The Funeral Cross are often the primary tribute at a funeral and represent extremely personal sentiments and feelings. These tributes are typically chosen by immediate family or close friends. Our Funeral Crosses are available in a variety of beautiful colours, shapes and sizes that will suit most budgets. Free delivery to the Chelmsford area including to the Funeral Director or Chelmsford Crematorium or home. 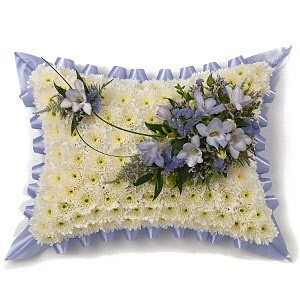 Funeral flower pillows and cushions signify a comfortable resting place for those who have passed. The tributes can be created by our florist either 'based' which means covered in a carpet of Chrysanthemums with a ribbon edge or 'open' which means flowers and foliage together. These are very pretty funeral flower tributes and come in a range of sizes and colours. Free delivery to the Chelmsford area including to the Funeral Director or Chelmsford Crematorium or home. Funeral letters to spell out a name. Whether it's for Mum or Dad, Son or Nan or if you want to make your own word or name. Flower letters are around 30cm high and are generally surrounded by ribbon to compliment the top flower colour​​​​​​. Realistically, a name that is 7 funeral letters long is about maximum for the hearse but names can be created in two parts if a name is longer.